He rigged a parachute as an awning and removed the aircraft's radio and batteries but then apparently walked off into the desert in search of help. Almost 100 miles from the nearest settlement, he stood virtually no chance. 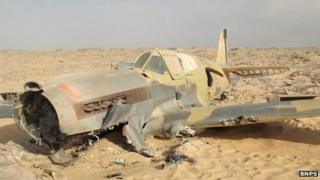 David Keen, an aviation historian at the RAF Museum, says the pilot broke the first rule of survival in the desert, which is to stay with your plane or vehicle. But the very same conditions which made the pilot's prospects so bleak have helped preserve the plane. Mr Keen says of the many thousands of aircraft which were shot down or crashed during the Second World War, very few survive in anything like this condition. He said: "Nearly all the crashes in the Second World War, and there were tens of thousands of them, resulted on impact with the aircraft breaking up, so the only bits that are recovered are fragments, often scattered over a wide area. "What makes this particular aircraft so special is that it looks complete, and it survived on the surface of the desert all these years. It's like a timewarp." Recovering Flt Sgt Copping's plane will not be easy. It is in a part of the desert which is not only remote but also dangerous, because it is close to a smuggling route between Libya and Egypt. The defence attache at the British Embassy in Cairo, Paul Collins, says he is hoping to travel to the area in the near future, but is waiting for permission from the Egyptian army. He told the BBC: "I have to go down there. This is a serviceman who was killed, albeit 70 years ago. We have a responsibility to go and find out whether it's his plane, though not necessarily to work out what happened. "He went missing in action. We can only assume he got out and walked somewhere, so we have to do a search of the area for any remains, although it could be a wide area. "But we have to go soon as all the souvenir hunters will be down there," said Mr Collins.